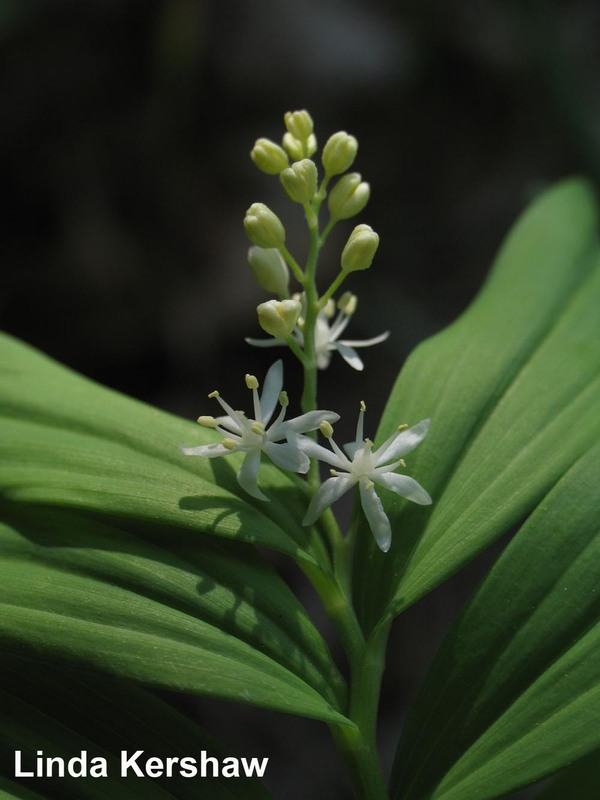 Maianthemum stellatum – The species name, stellata, means “star-like” and describes the white flowers. This herb has erect, often curved, stems 15 cm to 60 cm long. Leaves: Leaves are 2.5 cm to 12 cm long, light green, and have prominent parallel veins. 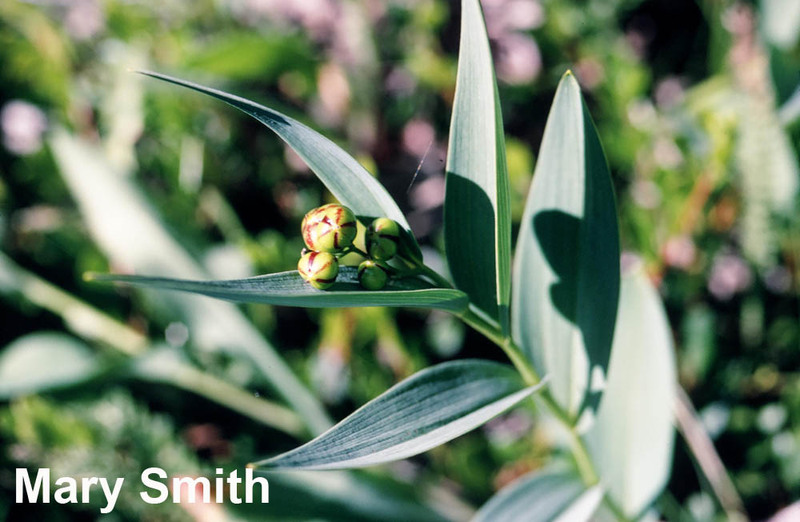 The size and shape of the leaves are very variable depending on where the plant is growing. In bright light plants can be short and leaves are stiff, whereas in shade plants are tall and leaves are limp and large. Flowers: Flowers, up to 6 mm wide, are white and star-shaped (have six petals). The flowers form a loose group at the end of a leafy stem. 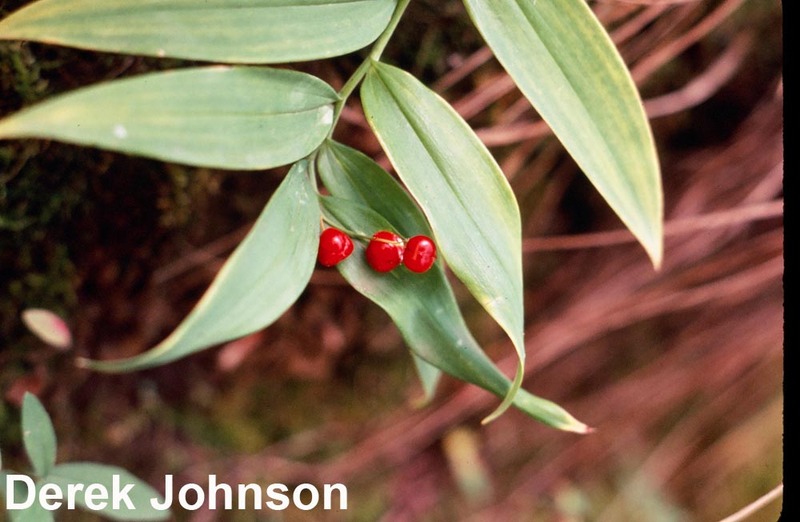 Fruit: Berries are greenish with dark stripes, then turn red, then nearly black in early fall. Widespread throughout most of Alberta, but less common north of Lesser Slave Lake. 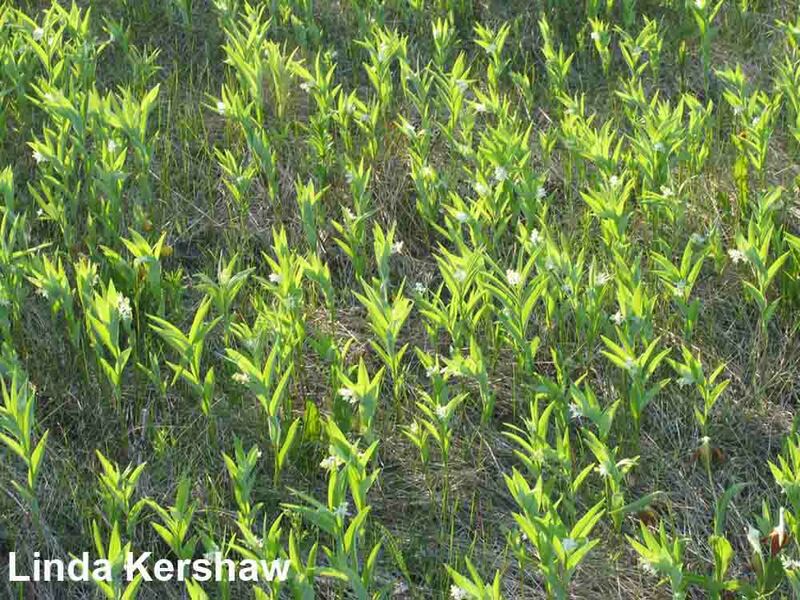 Star-flowered Solomon’s seal grows in woodlands, open meadows, and shores of sandy marshes. Flowers in May to early June. This plant spreads by its creeping rhizomes. By the time these plants have died down in the fall, more than enough food has been manufactured and stored in the underground stem to ensure the development of a new lot of leafy stems next spring. Bears are very fond of these berries and livestock readily graze on the plants. 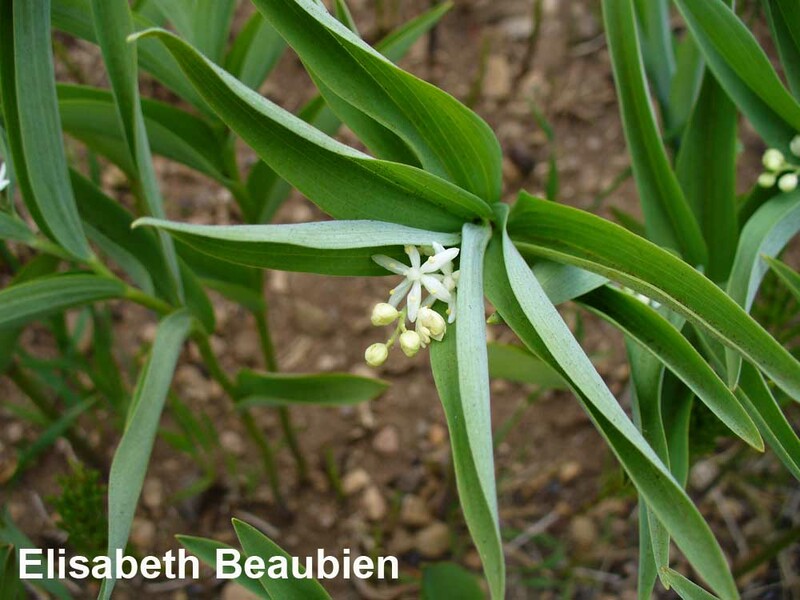 The sepals of the star-flowered Solomon’s seal flower are nearly horizontal. This position makes it easy for specialized insects to get at the nectar and pollen. The berries were eaten by some First Nations tribes, but they are sickly sweet and were not highly prized. Some First Nations burned the root as a smudge to quiet a crying child and to return someone to normal after temporary insanity. The powdered root was reportedly applied to wounds to help in the clotting of blood. They also used the root with food “during the time of plague to prevent sickness”. The plant was also mixed with other plants for use medicinally. Marles, R. J. et al. 2000. 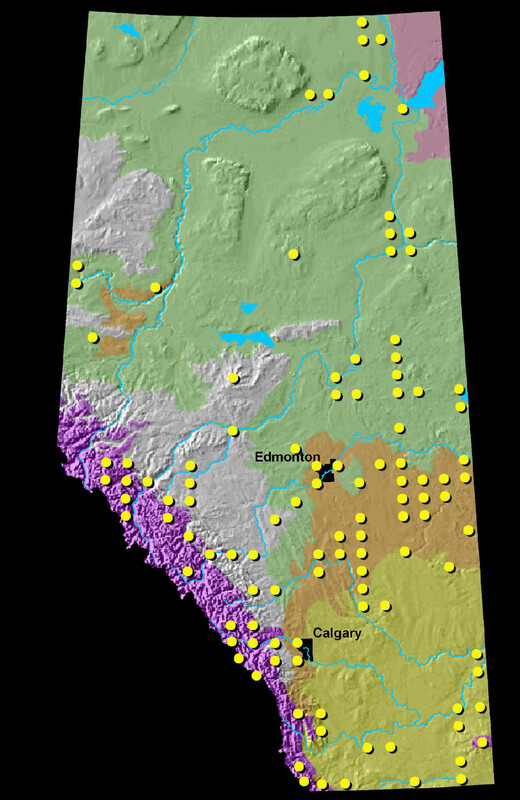 Aboriginal plant use in Canada’s Northwest Boreal Forest. Natural Resources Canada. UBC Press. Vancouver, British Columbia.